What Does the Future Hold for the ‘Click & Collect’ Delivery Proposition? Speed, convenience, reliability — all reasons we've grown to fall in love with “Click & Collect”. But where does its future lie? “Click & Collect” is a phrase used to describe the process of ordering online, and choosing to have your goods delivered to a local collection point (such as a “brick and mortar” store or post-office), ready for you to pick up, at a time convenient for yourself. The service is often free of charge and customers can usually collect their items, as soon as the day after they first placed their purchase. 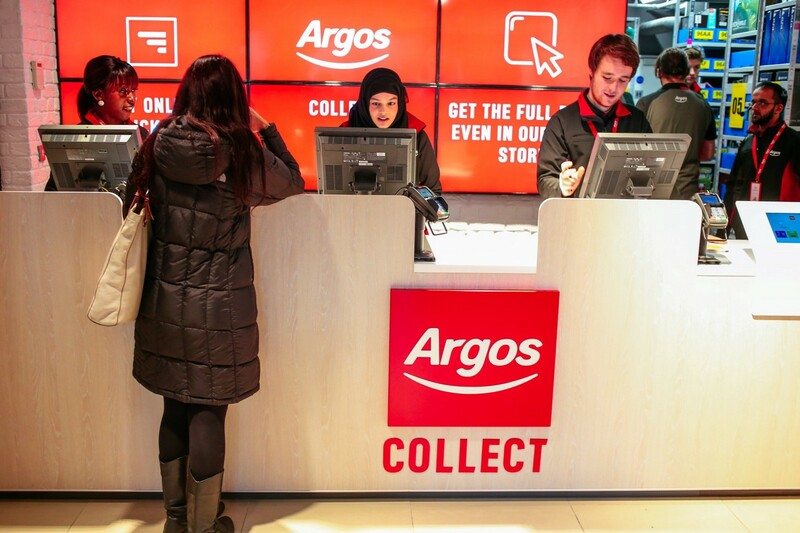 The very first “Argos Collect” digital store, located at Cannon Street tube station, providing just 170 sq. ft. of sales space. It’s fast — your delivery is usually available for collection, the day after you first placed your order. Fashion retailer, Next, offer FREE Next Day Delivery to store, for most orders placed by midnight, the night before. Now that’s quick! It’s convenient — gone are the days, where we have to stay in all day, waiting for the postie, or the courier, to deliver our goods. We now have the flexibility of being able to pick up a parcel from a store local to us, at a time that best fits around our hectic lifestyles. This is great for those working long, unsociable hours — nurses, hauliers, shift workers, etc — who aren’t necessarily going to be around, or available, in the daytime, when home deliveries tend to be made. It’s reliable — if you've ever had a parcel delivered by the likes of DPD, Hermes, and Yodel, chances are, your experience, was far from brill. Late deliveries, goods damaged in transit, the discovery of packages in the most unusual places — we've all been there. Low-cost courier services often “fail to deliver” (excuse the pun). For the most-part, having a delivery to a local collection point, limits the likelihood of such issues. It’s free (most of the time) — the delivery of goods to a collection point, is often free. Yes, depending on the locale of the collection point, there may be a cost associated with travelling there and back, but still, it’s a strong selling-point, when compared to other delivery options, which incur charges, and often, aren't as quick. 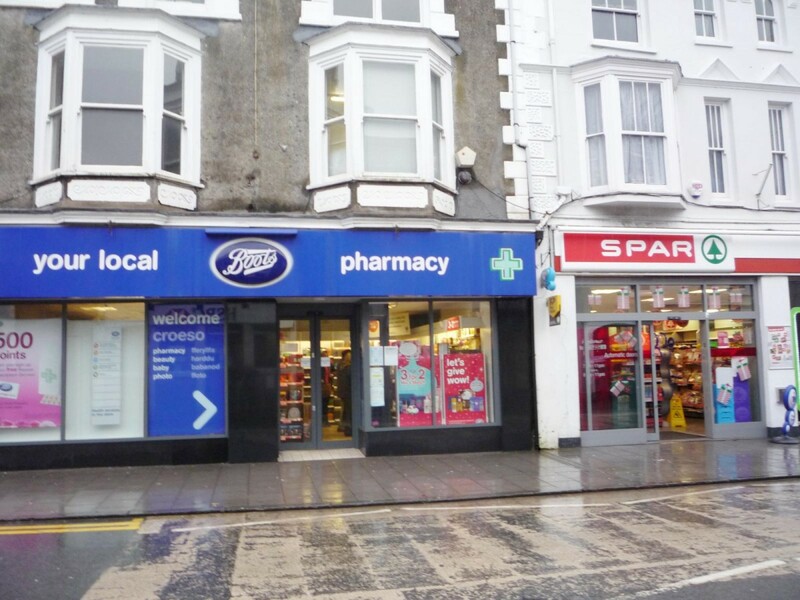 A local Boots store in Ceredigion, Mid-Wales. Lower costs — retailers with their own distribution networks, can ship customers’ Click & Collect orders to their “brick and mortar” stores, thereby cutting out the middle man — the courier. Higher levels of footfall — by delivering orders direct to store, Click & Collect is helping to drive customers back to the high street. Increased spend in-store — as customers collect their orders, it’s an opportunity for them to spontaneously spend more in-store. Lifeline to smaller, “out of town” stores — having the ability to choose which store your order is delivered to, helps to attract footfall and spend in many of the smaller, out of town / rural stores, which find it more of a struggle to thrive and survive, in comparison to those stores located in the city centre or on the high street. It’s the supermarkets, department stores and high-street fashion retailers, with a “brick and mortar” presence, who appear to pushing their Click & Collect proposition the hardest right now — John Lewis, Next, Boots, Argos, Tesco and ASDA to name a few. You've then got your online pure play retailers like Amazon, and more recently, eBay, the latter of whom, now offer buyers the opportunity to pick up their goods, from over 650 Argos stores across the UK. Click & Collect accounts for 45% of Next’s online orders, while 57% of click & collect orders through John Lewis are picked up at sister brand, Waitrose’s stores. What Does the Future Hold for Click & Collect? A Click & Collect service is now even available at my local fish and chip shop. If industry forecasts are anything to go by, Click & Collect is expected see explosive growth in the UK between now and 2017, with retailers of all sizes, looking to take advantage of this great delivery proposition. The growth is expected to be driven by continued roll-out of in-store collection, as well as alternative pick-up points, such as lockers, for example. Even my local fish and chip shop, Derby-based, Zan Fish, are now offering a Click & Collect service! Expect to see a massive shift beyond “traditional” collection points — think train stations, petrol stations, service stations, schools, etc. Ocado, Waitrose, ASDA, Tesco and Sainsburys, are all already working with the Transport for London, to offer Click & Collect services on the London Underground. Waitrose offer temperature-controlled, Click & Collect lockers, capable of storing cupboard, chilled and even, frozen products, allowing their customers the convenience of being able to pick up their orders, on the school-run, or on the way home from work, for example. A look into Waitrose’s “Click and Collect” lockers. On a slightly different note, imagine a world where we could collect our parcels from a McDonald’s of our choice! Yes, it may sound like an outlandish idea, and there would of course be a lot of work involved in rolling it out across all McDonald’s restaurants, but the ease of access, and convenience of being able to pick up your parcel from any given McDonald’s, would surely be worth future consideration. The key risk here, is causing disruption to the “fast-food” nature of their operation. With that said, there’s no reason as to why the drive-thru element of the restaurant, couldn't be adapted to create two separate queues — one for those purely wanting to order food only, and one for those wanting to pick up a parcel and a bite to eat, at the same time. Another alternative would be to have an Amazon Locker-style set-up, in the restaurant itself. Amazon Locker offers Amazon customers a self-service delivery location to pick up their parcels from. The lockers are located in a number of convenience stores across the UK, including the Co-operative Food. The concept of this service is great; however, it is limited in the sense that, because the lockers are often located in-store, you’re only able to pick up your package, during that store’s opening hours. If the lockers were available at locations that could be accessed 24/7, I could see this method of self-service collection, really taking off — both for the collection, and return, of items. An insight into why customers love InPost — a 24/7 parcel locker service. Another potential solution, would be the introduction of delivery locker warehouses (similar to self-storage warehouses), which again, can be accessed, any time of the day. To combat concerns of crime, a two-phase, “point of entry” security system, could be introduced to allow access to the specific area of the warehouse, where your locker is located — similar to that used by gyms that are open, all hours of the day (but remain, unmanned throughout the night). We've got drive-thru fast-food chains, coffee establishments, cinemas, and in the US, drive-thru banking (I dream about the day, drive-thru ATMs make their way across the pond), so what’s to stop us introducing drive-thru collection points? I briefly touched on this further above, discussing about how McDonald’s could lead the way with this, but better-still, it would be great to have dedicated drive-thru collection points, allowing us to pick up our parcels, from the comfort of our own cars. Suffice to say, not everybody drives, or has access to a car, but for those that do, there are numerous benefits to this collection method. Aside from the obvious advantages of speed, ease and convenience, it also reduces the stress of having to drive into the busy city centre, only to then have to pay to park, before queueing to collect your parcel from a packed store. Okay, so a handful of retailers already do offer “Express” collection points, but the majority of those that do offer Click & Collect delivery direct to store, don’t. As such, it means increased queue times for the customer and till operators, who are often somewhat reluctant to leave their till to locate your parcel, during busy shopping periods. The introduction of “Express” collection points, can only result in a more streamlined collection process, with staff better-equipped to locate and retrieve your parcel, much quicker. 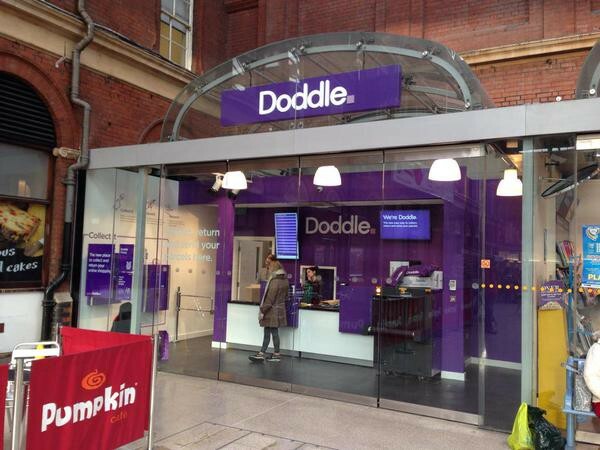 A Doddle shop at Norwich train station, which allows customers to “commute and collect”. Two of the key barriers to shopping online are the cost of delivery, and customers being deterred by inconvenient delivery times. Click & Collect helps to combat both of those concerns. It’s an exciting delivery proposition that benefits both customers and retailers alike. As customers become more demanding in their request for convenient, reliable and speedy methods of delivery, I anticipate more retailers will look to Click & Collect, to fulfil these expectations. 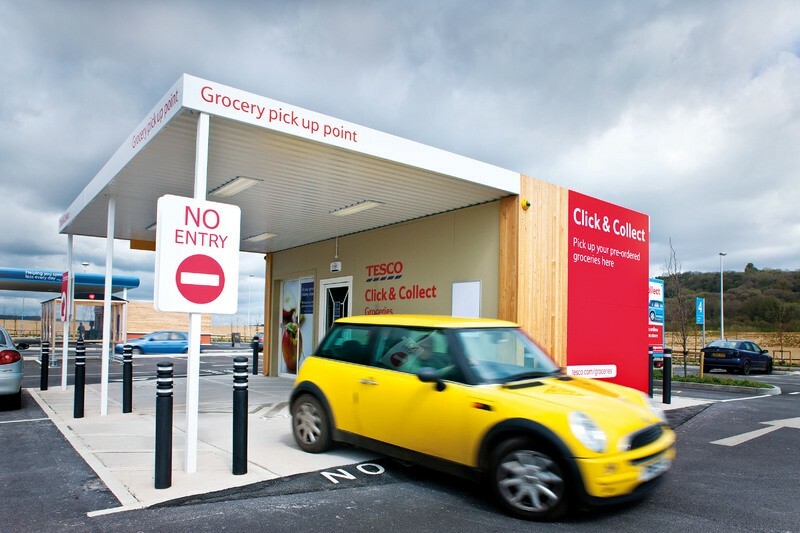 Those retailers already maximising sales and revenue, as a result of their existing Click and Collect efforts, will continue to push on, in identifying new collection points, accessible to the masses, at any time of the day — not just during daylight hours. As the need for, and reliance on Click and Collect continues to ramp up over the coming months, I expect to see a huge expansion in the use of delivery lockers — across supermarkets, shopping centres, public transport hubs, service stations, and petrol forecourts, and maybe even one day, fast-food chains. Further down the line, we may even see the introduction of delivery locker warehouses, and drive-thru collection points. Only time will tell. Originally written and published to www.uxchap.com on March 14th 2015, by Joe Pendlebury.